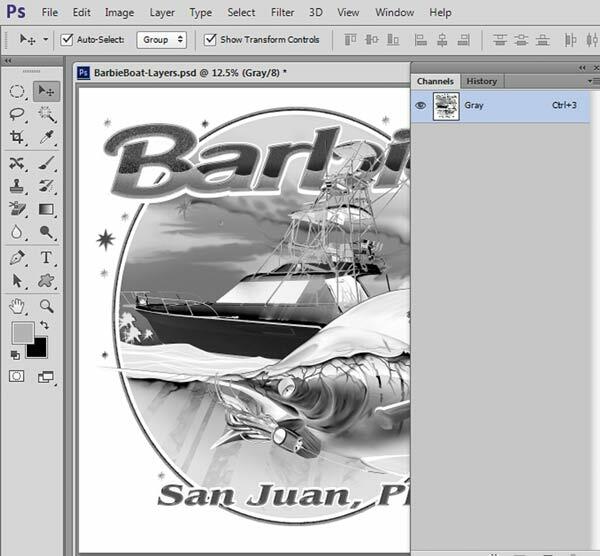 Don't be a vector snob, see how to do 1500 - 1800 separations per year in Photoshop. Read on to learn that we don't need any more vector snobs to get the job done right. It is almost impossible to elaborate on everything you need to know about color separating in a short article, but read on for the broad-strokes. But, I feel strongly that, if I can point you in the right direction and maybe cut through some of the myths and opinions that you hear - many of which are wrong - you will break out of your shell and begin to learn the ins and outs of great color seps. My opinions here come from personal experience; I separate, on average, 1,500 to 1,800 jobs per year for clients large and small. With my expertise as your resource, I can get you close and show you the real needs of a color separator. This one is easy. 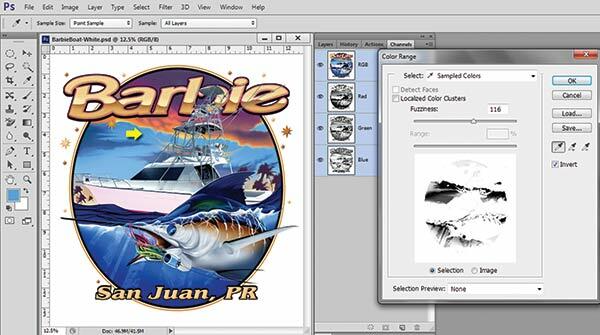 Use one of two popular "vector" programs, Corel Draw or Adobe Illustrator (AI). Windows users like Corel, while Mac users prefer AI. Frankly, I now get a LOT more AI files for color separations than from Corel. Why a "vector" program? They create razor sharp images (or as sharp as your printer will print). These programs are used for type, hard edge graphics, simple spot color images and yes, even high-end images containing photos and bitmap elements. A lot of high-end graphics are created in AI or Corel, but if they contain lots of shading/gradations and photographic elements, it is almost impossible to separate the color in those programs. I am using a new term: Vector Snob. I coined this to describe anyone who feels that the only way to output color separations - especially type - is with a vector program. Some of you are vector snobs. You know who you are. Why do I say that? Because I do 99.9 percent of my separations in Adobe Photoshop - a raster/pixel based program. These are jobs that go to high-end theme park clients, well-known motorcycle clients, and jobs that end up in Wal-Mart, JCP and more. The job might be created in a vector program but the separations are done in a pixel/bitmap program. More on this will follow. The key to doing spot color separations in a vector program is to convert all printable colors to "spot" or Pantone colors. You typically do not want to print CMYK. 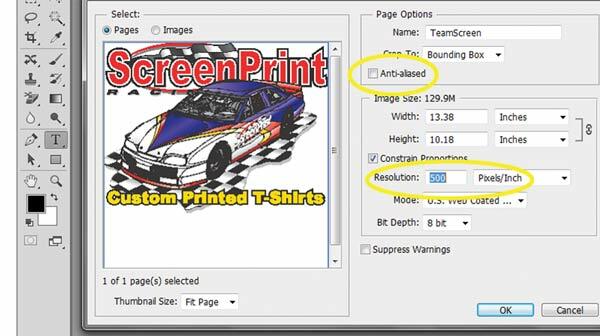 You want to print each color that goes on a screen, and, to output color separations from these programs, you need to use a spot color, color palette rather than a CMYK palette. Did I mention that I use Photoshop for all of my separations? Why? Because people do not send me their simple spot color images. They do not need me for that. They send me the images that are hard to color separate. 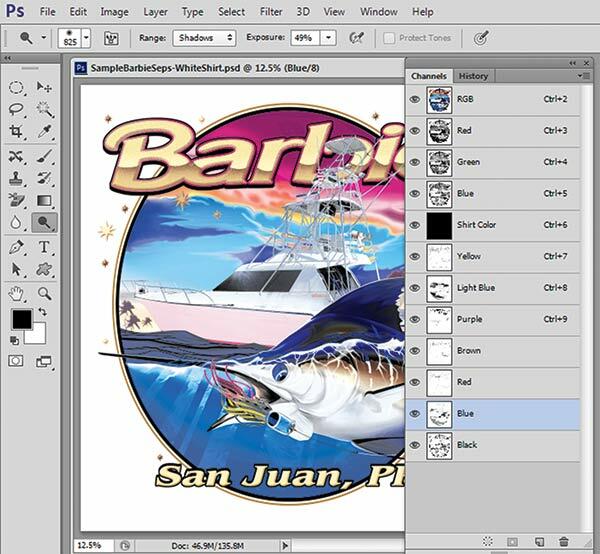 These can be images built in Layers in Photoshop or images built in Corel or AI that have bitmap/pixel graphic elements. You simply cannot separate images with embedded bitmap elements in AI or Corel unless you want to do straight CMYK (Please do not do that.). About half of what I receive comes from AI or Corel because the images contain a mixture of graphic elements created in a vector program, along with bitmap images. Why am I telling you this? Because you need to learn how to use Adobe Photoshop. It is not that hard, and every day I talk to artists who are masters at AI or Corel, but confide they simply "do not have time" to learn Photoshop. This article is not a Photoshop tutorial, but it is important that you start digging and learn the program. There are hundreds of thousands of online tutorials to help. Once you have used Photoshop for the first time, you will wonder what took you so long. 1. If you built the image in AI, you can open it in Photoshop. 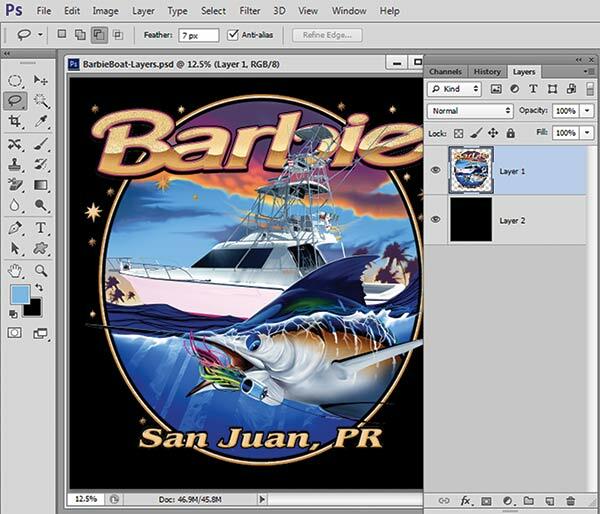 If you built the image in Corel, save it as an EPS file (without any shirt background) first. In either case, when you open the file in Photoshop, make sure to set the resolution and file size. 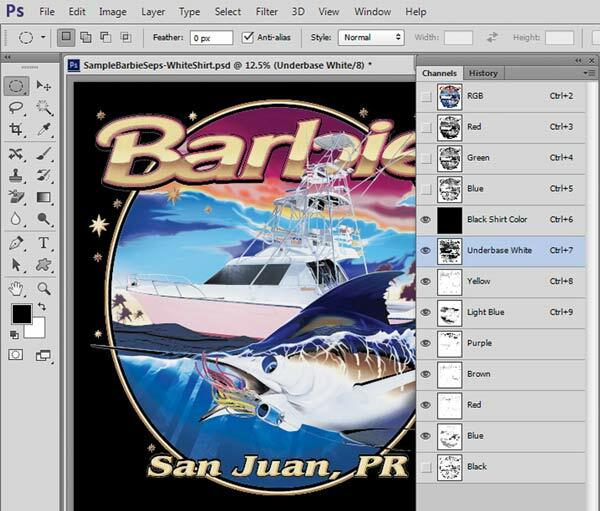 If the image is made up of mostly embedded bitmap elements, open it at 300dpi at the final print size. If you are a Vector Snob, then open it at 500 to 600dpi and UNCHECK Anti-Aliasing. This means the edges of the image will be more like those in the vector program (Okay, a little closer), and Photoshop will not try to soften the jaggies (by turning off anti-aliasing). The file will be larger, but with today's huge hard disks, it does not matter. 2. If the image is a low quality JPG then you need to work to get rid of the artifacts. There are a lot of JPG Enhancement programs. You can also do this in Photoshop. First, upsample the image to the correct final size and the resolution you want. Here, I will show you a "Scott" quick JPG enhancement routine (upsample first). In Photoshop - Filter/Noise/Despeckle. Filter/Noise/Reduce Noise/. Noise Strength 10, Preserve Details 60, Reduce Color Noise 20, Sharpen Details 15, Remove JPG Artifacts Yes. You will love this! 3. Do not be afraid to improve the contrast. 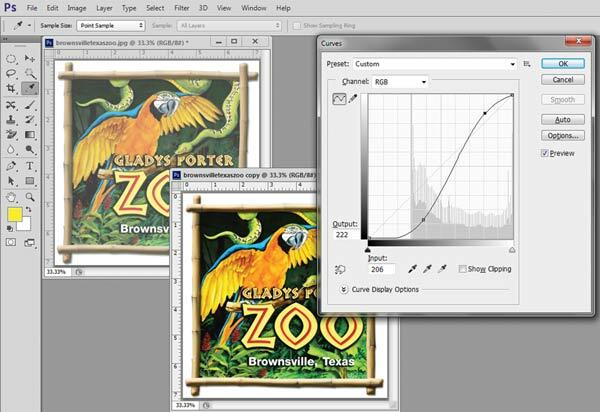 I like to apply an "S" curve to images to darken the shadows and lighten the highlights. This performs magic on flat files. 1. Use the Color Range tool to find specific colors. Click on Select/Color Range. Make sure Invert is checked. Place the Eye Dropper Tool on the color you want to "pull", and click. Use the Fuzziness Slider to pull more or less of that color. This is where the need for experience kicks in. When you feel you have achieved the color you want, click on OK. The famous "marching ants" selection will now appear around the color you picked. At the bottom of the Channels Panel is a rectangle window - Save Selection as Channel. Click. You have just created the first color in the separation process using Photoshop. You should note the color you selected, assign that color to this channel and make it a spot color channel. Set the Opacity to 5 percent (trust me) to preview how it will print on a color other than white. 2. Repeat this for all colors. Create a Shirt color channel, and place it above the separations. Put them in the print order of light to dark. If you assigned colors to each channel, including the shirt color, you can preview the separations by placing the "eye" next to each channel. 3. 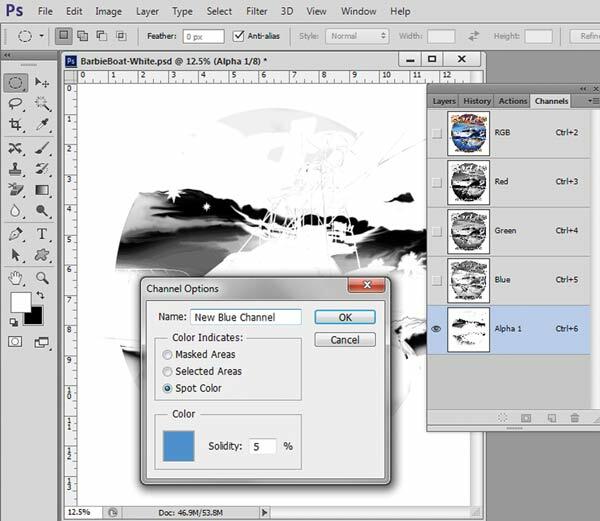 Channels print out of Photoshop. 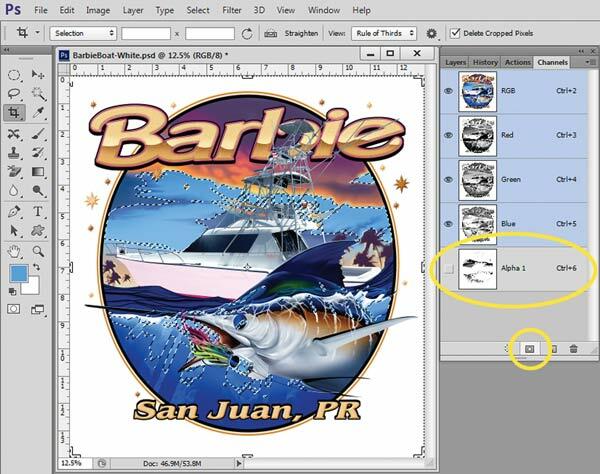 You will need a software RIP (raster image processor) to print halftones. Print these out at a halftone frequency of 55lpi and an angle of 25 degrees using an ellipse dot shape. Just buy into it. If using Photoshop CS5 or CS6, Adobe removed the popular "screen" button, and you will have to set the LPI and angle in your RIP. 4. Tell your shop to put these on 230 to 305 mesh (90 to 120cm), and hold every dot. You will end up with soft prints that look great. If your design is going on a dark shirt where you might need an underbase white, you will likely need to know how to make a quick underbase. 1. The simple way is to first "mask" around the image with a black background. That means all areas where there will be shirt color (commonly called the Canvas) needs to be black. You can use Magic Wand; create a new Layer if you have layers with transparent backgrounds; paint around the image if it has a soft edge; or use any method you know to get the canvas area black. There are even programs that do masking for you. 2. 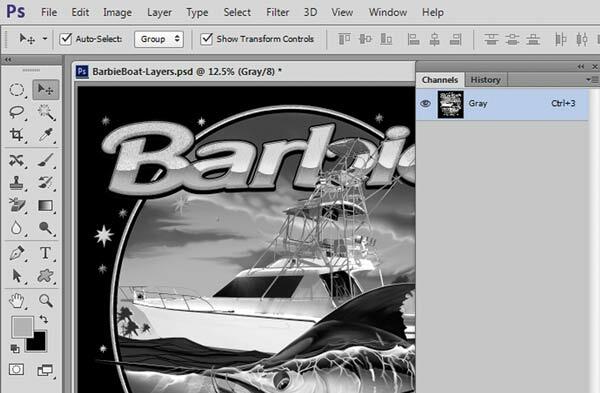 Convert the image to Grayscale - Image/Mode/Grayscale. 3. Invert the image - Image/Adjustments/Invert. 4. 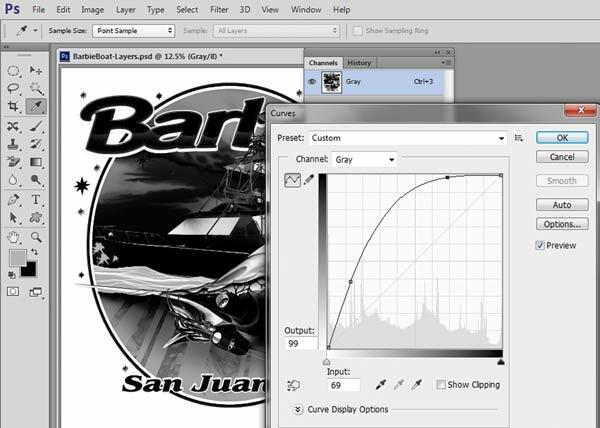 Apply an aggressive Tone Curve to darken the image - Image/Adjustments/Curves. 5. A good underbase has base where there is red, brown, blue and other colors that grayscale misses a little. That would be considered an "Advanced Underbase", which is another article for another time. Obviously, there are lots of third-party plug-ins for Photoshop that automate the above processes. They do the heavy lifting, and, in many cases, can get you close, while in other cases they can miss lots of key colors. It is in the case of the latter where knowing how to create your own channels is key. 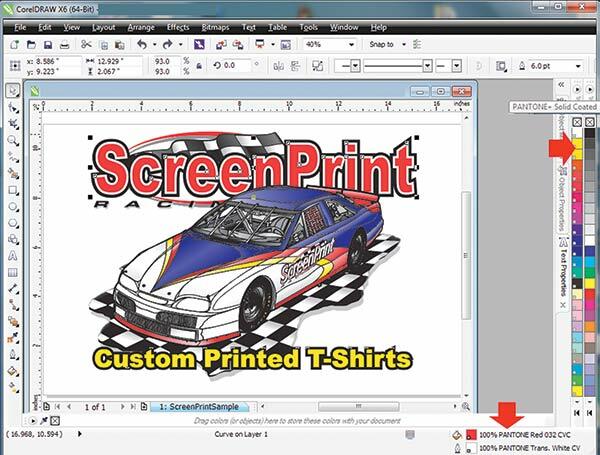 There are a lot more advanced techniques, including doing minor trapping and choking of colors (making them fatter or skinny), and using the various Photoshop tools to darken or lighten parts of separations to make them print better. For now, this has been Color Separations 101. This article appeared in the SGIA Journal, April/May 2013 Issue and is reprinted with permission. Copyright 2013 Specialty Graphic Imaging Association (www.sgia.org). All Rights Reserved.